I'm thankful for LAUNDRY! What? Am I serious? But, I am thankful. No, I am not crazy (too many sniffs of the detergent), but I am learning to look at things from a different perspective. I believe that's what brought Shadrach, Meshach, and Abednego through the fiery furnace with such a positive attitude. They didn't focus on the blazing furnace, but on how powerful our God is! Their faith led the way. Instead of looking only at the huge piles of laundry in my floor....I need to think differently. I have been blessed with three precious beings who require my attention. Without their laundry, I would not have them. And that, is an awful thought! Whew! I remember a time when I only had myself to take care of. I also remember how lonely I was at times. And how I prayed for a family! God is Great! 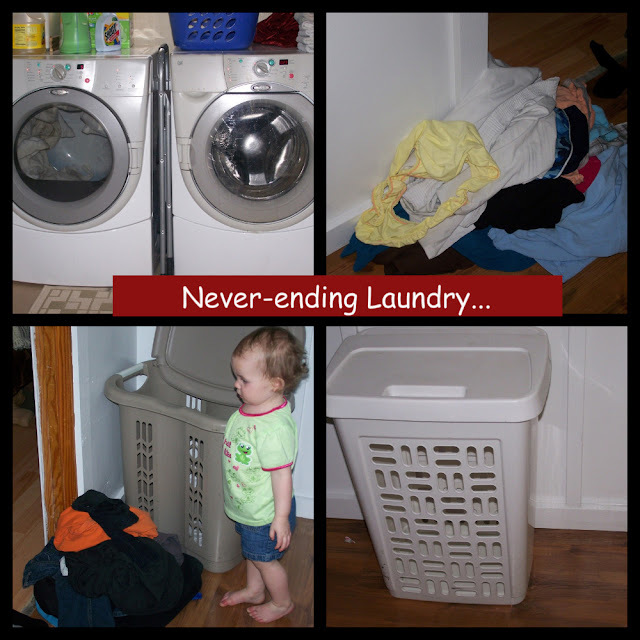 Laundry is not, but our family is! I am thankful for LAUNDRY!